An artful craft that demands mastery. Bread making traditions in Italy commonly start with a sourdough starter called “pasta madre” or “lievito madre”. This is a firm sourdough starter maintained at around 50% hydration and continuously propagated with daily refreshments. The wet style starter is not so typical with professionals but has shown some adoption in modern times, mostly by home bakers. Maintenance of the madre and refreshments vary according to each bakers’ practices but is typically fed at a ratio of 1:1 (madre:flour) daily or twice daily. A symbiosis of yeast and lactobacillus bacteria, the dominant species, usually L.sanfranciscensis is hetero-fermentative and is capable of producing lactic and acetic acid. Keeping it warm (~28C) promotes the ideal balance of acids; 4 parts lactic to 1 part acetic for sweet levened pastries. At cool room temperature a balance of 3:1 (lactic:acetic) is ideal for bread. To keep it healthy and viable, maintaing a temperature of 15-18C and feeding every 12-24 hours is best. Once a week if refrigerated to around 4C. There are two common techniques for the conservation during this period. Bound. 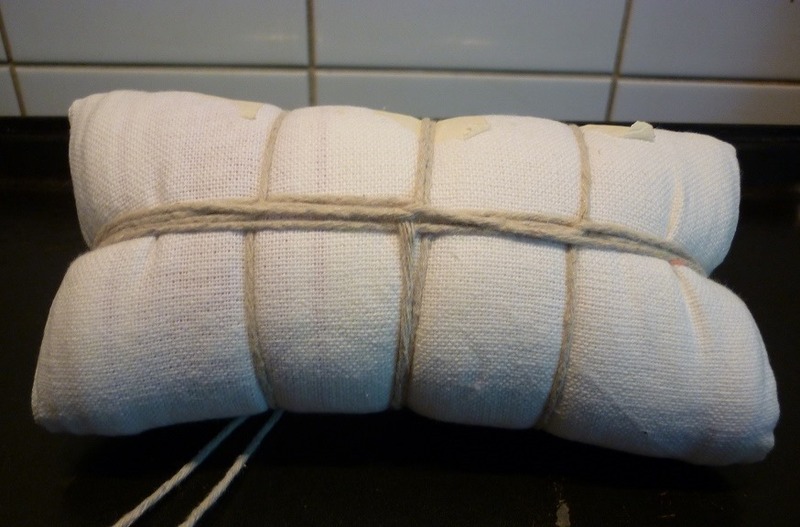 The lievito madre is wrapped in cloth and tied with rope. In water. The lievito madre is placed directly into a bowl of cold water. In water (partly aerobic, with oxygen) the madre is less acidic than when wrapped (anaerobic, without oxygen). Refreshments are performed in the warmth (25-30C). Usually only one refreshment is needed for making bread. For highly enriched dough like panettone, at least three refreshments are made. The optimum pH varies according to the recipe but is typically between 4.1-4.8. What is the gram measurements for your starter using flour, raisins and strawberries? You mentioned feeding every 4 hours for what period of time? How long does the starter take to mature.? I would love to give it a try this year but need a little more specifics, like a step by step process. I must give you props for an amazing job on the panettone. The best I have seen so far on the Internet. If you have a regular sourdough already, it may be easier to convert it. This is a 50% hydration sourdough fed always 1:1 (eg. 100g leaven, 100g flour, 50g water). You’ll need to feed it daily (every 12-24 hours) keeping it at room temperature, wrapped in cloth and tied tightly. It will take at least two weeks to become mature. Once mature, feed 3 times every 4 hours at 28C before using for cakes like panettone. It must triple in size each time. If not, take an extra 10% leaven on the next feed. I’m glad you like my Panettone, Thank you. Thank you so much for responding. I made a lot different kinds of sourdough starters last year, which led to a lot of waste with the excess sourdough. I have some that I have dried out, and some I have kept frozen, however I would like to try it at 50 % hydration and follow your method and see what happens. I did stumble on you at the fresh loaf where I am a member researching panettone. Thanks again. Hello! Someone recommended your site to me, because I am trying to keep and make whole grain sourdough breads, but they are so used to sweeter breads that they can detect any kind of sour no matter how soft my bread ends up; they just don’t like it. I know I am risking having a slight sour taste by using whole wheat flour, but could I possibly use your starter with freshly ground wheat? I started a Peter Reinhart starter last week and I am up for my first refreshing, but it seems even at a 75% hydration, my family is still a bit sensitive. I know my starter is still young and that accounts for some of the taste, but I cannot afford to keep throwing out bread. I would like to have some winning breads with my duds as I keep experimenting. In any case, please let me know of any adjustments I would have to make to your process by using whole wheat flour? Also, since this is a 50% hydration, what adjustments do you usually have to make to recipes that call for 100% hydration starter and uses the sourdough as a levain? Thanks so much for any help you could give me! Hello! Someone recommended your site to me, because I am trying to keep and make whole grain sourdough breads, but they are so used to sweeter breads that they can detect any kind of sour no matter how soft my bread ends up; they just don’t like it. I know I am risking having a slight sour taste by using whole wheat flour, but could I possibly use your starter with freshly ground wheat (I have hard red winter wheat and hard white winter wheat)? I started a Peter Reinhart starter last week and I am up for my first refreshing, but it seems even at a 75% hydration, my family is still a bit sensitive. I know my starter is still young and that accounts for some of the taste, but I cannot afford to keep throwing out bread. I would like to have some winning breads with my duds as I keep experimenting. In any case, please let me know of any adjustments I would have to make to your process by using whole wheat flour? 1. how long does it take for the yeast to become mature using the water method? 2. when you start feeding every 4 hours are you still putting the yeast in the water or are you proving it just in a bowl. 1. When it floats in less than three hours at 18C it’s a good sign of maturity. Less than 1 hour it is very strong. 2. This stage is not done in water. Just loosely covered with cloth. ok so my starter has been floating in water for a week and a half now, its had a feed every day of 500g flour (caputo) 500g yeast and 250g water at 20 oc. its kept in a bakery proover at 18oc but its not floating until 7 to 8 hrs?? should i continue to feed it everyday until it floats in an hour?? i have tried to make a panettone using this yeast. i feed it 3 times every 4 hours then made the 1st dough using cresci book ( modern panettone recipe). it was kept in a proover set at 28oc, the dough did move a bit but after 15hrs it had not tripled so i gave up. does this mean the yeast is not mature enough yet? The method described on this page is a maintenance routine applicable to a starter that has already been established. 7-8 hours is far, far, too long. Allow the starter to mature before feeding again, there are many way to do this. Don’t run before you can walk. Also the quantities of flour and water you are using very wasteful at this stage. sorry me again, when i feed my yeast everyday before i feed it i slice it up and put it in water with a little bit of sugar in for 15 mins. is this the correct thing to do ?? I wonder if this kind of starter will be help me to avoid sour breads which I do no like for sure. I do prefer au levain french style breads with no sign of acidity. Apart from converting my starter to stiffer, can you suggest me any tips for bread making such bulk fermentations time etc…as I do not want to leave to long so it will taste sour. By the way how do I know when the starter is ready if this is stiffer so I might not pass the float taste ?. I am so intrigued about the italian stiff starter soaked in water to proof method. I saw couple of pictures/videos of floating rolls of dough on instagram but that’s all, nobody says or shows how to proceed or more info. You were the most informative link so far I’ve come across and I was wondering if you can give me any suggestions of links or books that I can learn more about this technique. 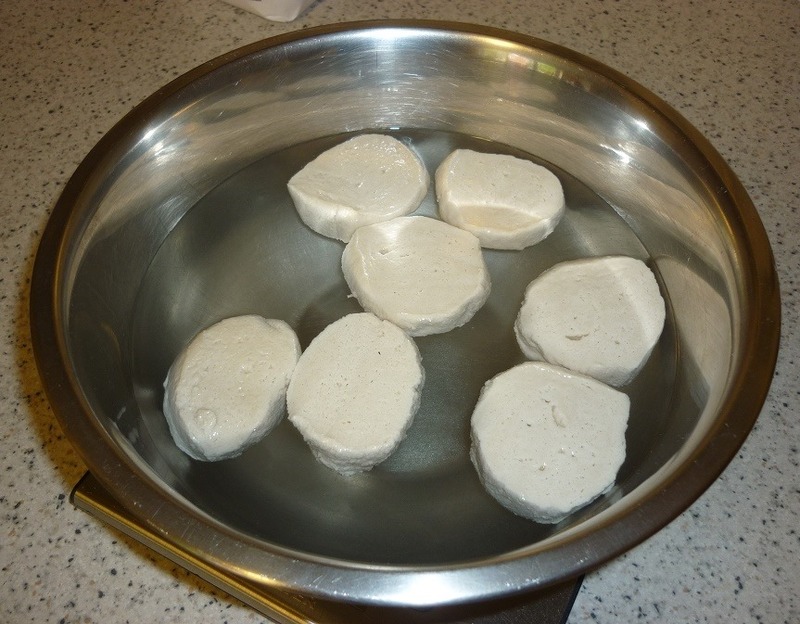 How do you physically feed such a solid leaven as the wrapped one or the one floating in water? Hi, I’m about to try my first panettone soon and would like to know if the 16-18°C maintenance is in regards to the both the water temperature and the madre, or just the water temp. Currently my madre temps are ending up at about 21-24°C after mix, and while the water temp is 17-18°. It floats within 2hrs, but I am concerned the dough temps might be too high thus giving me inaccurate feedback. Anyhow, thanks for your time and all the good info. What does the texture of the feeder starter look and feel like after the refreshing? I’m concerned mine doesn’t look or feel right? It should be dough-like. Firm and dry but pliable. Somewhat like pasta dough. Use less water if you need to. 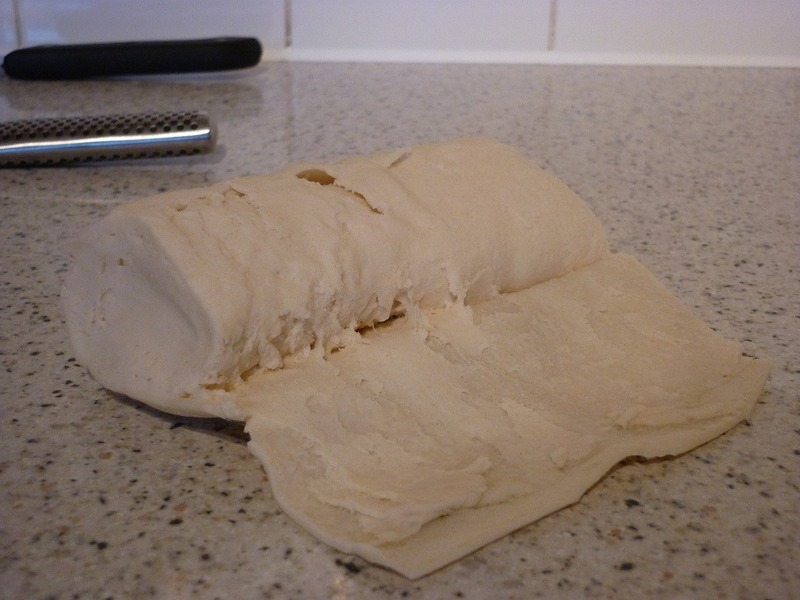 When using the bound method I’ve read that you put the dough through the dough sheeted to build more strength, then wrap into a log and wrap in cloth then bound. Is this correct, and if so, how long do we leave out and what temperature before refrigerating? Certainly that is one method. 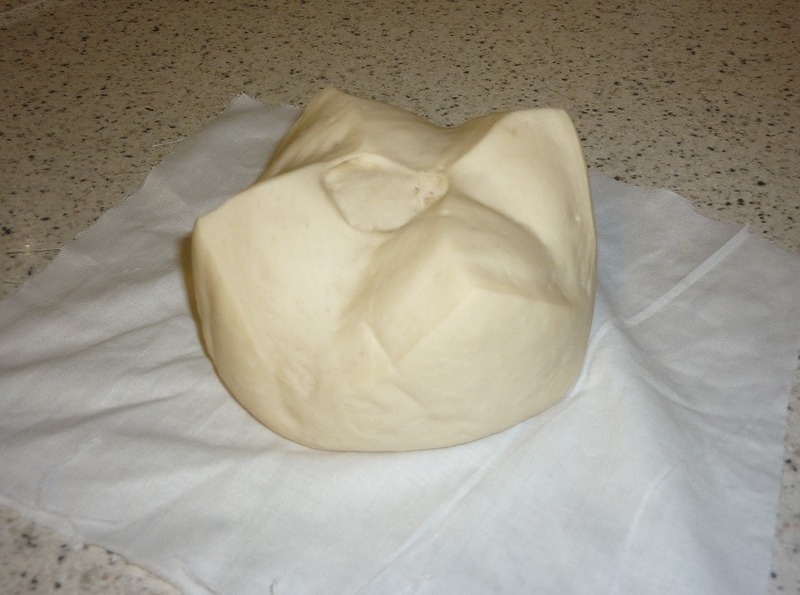 Using a sheeter is useful way to knead such a firm dough. Normally you would allow the rope to pull taut before refrigerating (about 1 hour). You only need to refrigerate if you are letting it ferment for more than 24 hours otherwise keeping it at 18-20C is fine. What type of plastic do you recommend for wrapping, prior to rolling up in the cloth? I would assume you would want a thicker, 3-4mil plastic, as I have tried thinner and the madre just blows out. I’m not sure if the rolls of clear plastic found at a hardware store are food grade. Hey Michael- Is it always a good idea to bathe the yeast prior to starting the refreshment regimen for baking? How do you determine if it needs to be bathed? My wrapped madre has been fermenting to a ph of 4.1-4.2 at 62F – I feed at this stage. Thanks again for the help! Hi Jason. Massari recommends bathing be done always after the storage phase and before refreshments. Although the bound method promotes the development lactic acid the madre still developes acetic acid during the storage period. The bathing removes the acetic acid. Thanks for all the great advice, Michael! Hi Jason. You can email me at lievitomadre@outlook.com if you’d prefer.